This article focuses on understanding human behaviour by providing an insight into its underlying mechanisms, and aims to widen the view on the military possibilities for achieving mission goals. The article intends to trigger a more behaviour-oriented view on military operations: how military actions can influence behaviour and thereby achieve military goals, by integrating traditional with non-traditional military responses. It describes what the authors think needs to change in the military mindset and the process of design in order to effectively employ military means to affect cognitive processes and change human behaviour in traditional and non-traditional ways. Manoeuvre is also psychological influence, and psychological engagement is also playing hardball. Incorporating all methods in military actions is inevitable. 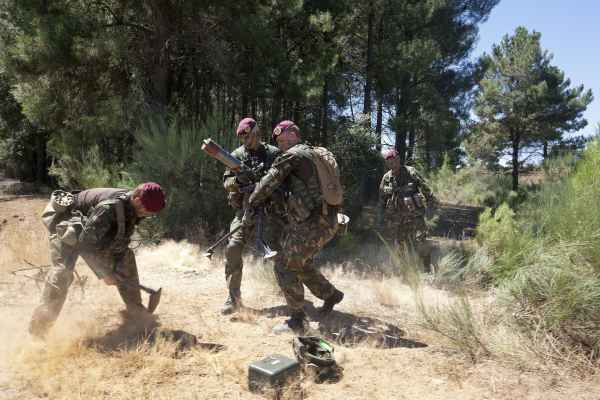 The Dutch military doctrine on Land Operations states that commanders should design and plan operations to influence relevant actors’ behaviour that forms the basis for executing military activities. In other words, mission goals need to be operationalised in terms of the behavioural change desired of actors. Modern-day conflicts and military success are measured not just in terms of seized terrain or the physical destruction of an opponent, and as such, require a broader take on the concept of fighting, in which all aspects of modern operations are brought to bear. However, recognising this principle does not automatically answer the question how to influence behaviour. Determining an effective approach to influence behaviour depends on many factors, such as the type of conflict, cultural and historical context, and the type of actors involved in the conflict. Learning that a solely traditional military approach is ineffective, or even counter-effective, is often done the hard way. For instance, as Tate (2014) describes, the Nigerian government’s initial response to Boko Haram, which was characterized by reliance on traditional military responses, failed because it empowered rather than defeated the organization. Examples like these highlight the importance of the human landscape. Understanding the actors involved requires more than a contextual understanding of history, culture and religion, challenges and grievances. It also requires psychological understanding of human behaviour as the result of cognitive processes. Understanding these processes, how they lead to behaviour, and how (or by what) they are affected, opens a world of possibilities to influence and change actors’ behaviour in traditional and non-traditional military ways. This article focuses on understanding human behaviour by providing an insight into its underlying mechanisms, and aims to widen the view on the military possibilities for achieving mission goals. The article intends to trigger a more behaviour-oriented view on military operations: how military actions can influence behaviour and thereby achieve military goals, by integrating traditional with non-traditional military responses. To achieve this, several engagement points are described: elements one can alter to affect behaviour by understanding the cognitive processes underlying behaviour. The article concludes with the authors’ view on how the Armed Forces should apply deliberate behavioural influence in military operations. Changing human behaviour is the core of conflict intervention. Whatever a conflict is about, when (groups of) people show unacceptable behaviour to achieve their goal – e.g. violence, violation of human rights or territorial integrity – intervention can be deemed necessary to stop that unacceptable behaviour. As the Land Operations Doctrine says: influencing and changing behaviour of actors (involved) in conflict, is key to military operations. Whether in combat operations or as part of a comprehensive effort. Military operations are about conducting military activities to influence actors to change their behaviour. Desired behavioural change can range from military forces withdrawing, clans ending violent clashes, or community leaders ending their support of violence. For the military, behavioural change usually entails inhibiting actors’ negative and/or extreme behaviour that disrupts the community’s or society’s ‘normal’ or ‘civil’ pattern of life. This can be done by eliminating the actor as a whole; soldiers may use legitimate force to change actors’ behaviour. However, soldiers can influence behaviour by means other than use of force, which still falls within the realm of military operations. 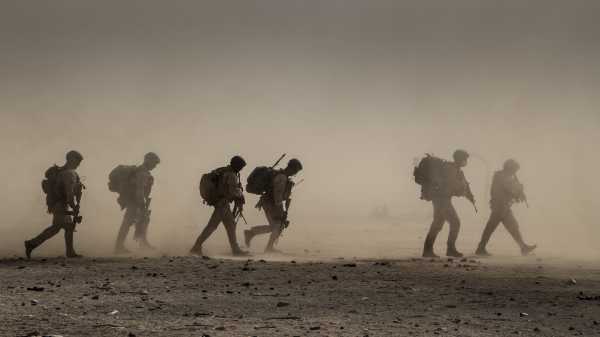 Soldiers can therefore be seen as ‘behavioural change agents of a special kind’. This article specifically explores the ‘other’ options the military has to change actors’ behaviour. The example of Boko Haram shows the importance of the human landscape, in which psychological processes are the central element. Such processes are characterised by the emergence of the group (e.g. recruitment by addressing people’s ideology, ethnic and religious sentiments, grievances and needs; by eroding social trust and coercion) and in the strategy to counter terrorism. Military forces should not only contribute to these types of integrated strategies, but also consider employing military means differently, to be effective in inhibiting undesired behaviours and stimulating desired behaviours. The conflict environment, the actors, and the interactions between them, are a system. Conflict intervention is aimed at changing a system state to a more desirable state. When entering the area of operations, either physically or in cyberspace, military forces become part of that system: they become actors, interacting with the environment and all other actors. There is a large quantity and variety of actors to interact with and to engage in order to achieve objectives. All of these actors are important for system balance – not just ‘the enemy’. Based on a solid understanding of actors, the environment and the conflict,, military activities should be focused on changing those behaviours crucial to (the restoration of) the balance in the system. Actors: can be individuals, (human-machine) teams, groups, organisations, communities, societies, governments, states. 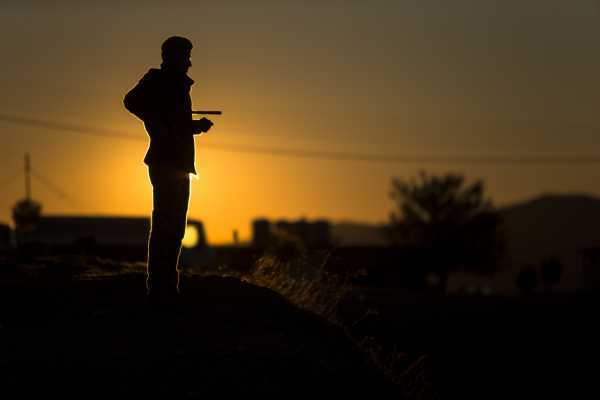 Actors can be ‘adversaries’, (para)military units, criminal organisations, gangs, terrorists or guerrilla groups, but also employees of the local government, the security apparatus (police, army), members of local charity organisations, and citizens or ‘civilians’ in all types of communities. Behaviours: are actions of actors that change the state of their ‘world’. These can be involuntary or voluntary in nature, subconscious or conscious, unintentional or deliberate, overt or covert. Undesired behaviours can be of various nature and impact, ranging from discrimination to genocide; from corruption to trafficking people, drugs or weapons; from intimidation to slavery. On a more concrete level, behaviours can be about (the actor’s ability to) move/relocate, provide information, coordinate/command, process information or communicate. System: the physical, social and digital environment, the actors in that environment, and the behavioural dynamics between those actors (including conflict) can be seen as a system. Orchestration of military activities has always been a prerequisite for effective campaigns: manoeuvring the right units towards the right target at the right time . Traditionally, that target is a person, area or object. Taking behavioural change as a basic principle changes this. In this view the behaviour of the actor is the target, not the actor himself. In a few cases does ‘the whole actor’ (and thus all of his behaviour) need to be eliminated; however in most cases only specific behaviour needs to be changed. In addition, engagement of terrain or objects (e.g. destroying weaponry, infrastructure) is not a goal in itself, but a means to influence and change actors’ behaviour. Seeing behaviour as the target requires knowledge of human behaviour and behavioural dynamics. The difficulty of engaging behaviour is in the specificity – inhibiting some, eliciting or not changing other behaviours – and the unpredictability: uncertainty cannot wholly be eliminated as many factors play a role. This article shows how the art of warfighting and managing complexity can benefit from social scientific insights. Therefore, it focuses on the psychology of individual human behaviour. Behaviour is the result of a continuous interaction between an actor and his environment. The actor, as part of the environment, constantly receives and perceives input – information – from the environment, for instance: hearing a helicopter, feeling heat, seeing expressions of other actors. In addition, the actor perceives internal information such as his heart racing, a ‘gut feeling’, certain thoughts or desires. Automatic: this is the reflex to an observed stimulus (e.g., startle from a loud noise), or conditioned responses (‘Pavlovian reaction’). Rule-based, heuristic: these are so-called ‘if-then’ rules, based on experience and/or training. People (implicitly) learn ‘in situation X’, ‘behaviour Y is most appropriate’. Conscious decision making (novel engagement): there are situations in which available heuristics do not seem appropriate. This novel situation involves formulating alternative ways of dealing with the situation, weighing alternatives, and deciding which alternative to use. Within the field of social psychology the distinction between rule-based action (heuristic) and conscious decision making (novel engagement) is sometimes also referred to as system 1 versus system 2 thinking, or the peripheral route versus the central route of information processing. People hardly behave according to rational thought and conscious decision processes – although they like to think they do. In practice, human behaviour is based much more on automatic and rule-based responses, and more influenced by emotions than people realise. This appears to be founded in evolution in combination with the neural structures of our brains. This is interesting, because the use of heuristics and the influence of emotions on human behaviour make people susceptible to being influenced – either consciously or subconsciously. To influence actors’ behaviour via the three pathways described above, one needs to understand the cognitive functions needed for these pathways: observing, appraising, and deciding. These functions relate to the OODA loop as developed by John Boyd, which is well, known in the military context (see figure 1). Observe: The first step is perceiving the information from the environment and/or oneself: see, hear, smell, taste, feel, think. If nothing is perceived , there is little to act on. Attention plays a large role in perception; information is easily missed without attention for it. Perception is done via the senses (that can be augmented by technology). Appraise: After perceiving and becoming aware of the information, the information is appraised. The primary appraisal question is ‘am I in danger, or am I challenged?’ If the answer is ‘no’, the information is ignored. If the answer is ‘yes’, a secondary appraisal follows in which the information is processed, filtered, and emotional value is attributed. In other words, the determination what the information means to a person, and how it impacts, is made by that person. In addition, the perceiver evaluates the information whether a situation can be dealt with as in previous situations. If the situation coincides with a prior one, an unconscious rule pushes a person to act. This is called a heuristic. When a situation needs more and particular attention, a person starts with conscious decision making and problem-solving. Rules can be based on coping style, culture, doctrine, experience, etc. The appraisal process regulates behaviour to a large extent, and is thus the most interesting process to influence when behavioural change is desired. Decide: Information that cannot be adequately dealt with by means of heuristics requires conscious effort. Rational weighing of facts, arguments and alternative actions takes place. This requires time and cognitive effort – in most cases people try to avoid this. In addition, individual factors such as personality or upbringing influence how people decide, and procedures such as random choice or compromise, and cultural or societal norms such as democratic or authoritarian, play a role. Act: This is the behaviour in response to the information. It is done via actuators, which can also be augmented (by technology). Behaviour is the only element visible to the outside world and to other actors. What takes place in observe, appraise and decide has to be inferred. This can be done by hypothesizing and by testing, through ‘probing actions’: do something to the actor or his environment, monitor and analyse how he acts, understand this action and use that knowledge for your next action (learning). As said, behaviour is a dynamic and continuous interaction between an actor and his environment. Information from within the actor and/or his environment is the input and the actor’s behaviour is the output. This output changes the environment and becomes input (information) for other actors. Behaviour thus consists of sequences of interactions: ‘action chains’. This interaction cycle is visualised in figure 2. The actors in the system continuously interact and influence – and are influenced by – others in the system, deliberately or not, including the military forces present in that system. Understanding the cognitive functions and pathways leading to behaviour (as visualised in figure 2), raises the next questions: How can behaviour be changed? With the goal to change specific behaviours, how can we intervene in the OODA loop? How can cognitive processes be affected, which all occur in the mind? Many ways exist and social sciences provide multiple theories on human behaviour, decision making, and influence techniques or strategies that can be used. The influence principles described by Robert Cialdini in his 1984 book on persuasion and marketing are well-known. These psychological theories and influence tactics, applied in marketing, behavioural economics, public policy, and clinical psychology, need some adaptation when applied to the military domain, because they do not specify what can be physically or directly ‘gripped’, ‘manipulated’ or ‘attacked’ to psychologically influence an actor to change his behaviour. Ideally one would like to be able to directly alter an actor’s cognitive and emotional processes, but as long as people are not able to directly control and manipulate the brains of others, different ways are needed to influence cognitive processes and behaviour. Emotions play a large role in human behaviour. This strong influence of emotions is largely related to people’s inherent drives and needs. Many needs are of a psychological nature: the need for simplicity and ease; freedom of action and/or choice; fairness; ambiguity reduction; risk and regret avoidance; a positive self-image; consistency; closure; the need to be right; and to reduce uncertainty. Sometimes people change quite radically their attitudes, beliefs, and behaviour, in order to meet these needs. Cognitive dissonance, rooted in the need for consistency, is a good example of this. The relationship between emotions and behaviour makes people susceptible to influence. People strive to have their needs met. Unfulfillment of needs results in negative feelings (anger, frustration). Engaging these psychological needs is a powerful tool by, for example, inducing desired behaviour by fulfilling these needs (reward), instead of punishing undesired behaviour. Threatening the fulfilment of needs also works. In addition, humans tend to resist changing their behaviour. Consequently, forcing change leads to reactance, scepticism and inertia. Providing people with a sense of freedom reduces this inherent resistance. By offering choices, but making sure the alternatives are pre-fixed, desired behaviour can be induced. Implementation intentions can also help reduce resistance: having people define ‘if-then’ rules about when and why they will change their behaviour. Humans’ states of mind affect behaviour. People under stress are less open to change, as stress inhibits problem-focused coping. Priorities, goals or desires change under stress, and basic needs such as survival and self-preservation become more salient. Fear and stress reduce the ability to reflect on one’s own and others’ behaviour. Moreover, stress induces: (1) a transition from slow, thoughtful responses to more rapid emotional responding; (2) attention focused more towards immediate cues, causing tunnelling; (3) decision making without considering all available alternatives, and (4) shallower search for information, and reduced accuracy of judgements. Bringing people into a positive state of mind can be important to changing behaviour, though stress can still be useful in the context of, for example, deception or ‘forcing’ certain decisions. It is important to take the role of individual traits into consideration, for instances personality, and individual differences such as people’s (life) experiences. Eliciting these can trigger a memory (appraise) which leads to a physiological response (increased heart rate, palms sweating) generating a ‘fight or flight’ response (heuristic), which in turn stimulates behaviour (e.g. flight). The same kind of effect of experiences is seen in communities or societies which have endured war or poverty for long periods of time: it has made them either more sensitive, or insensitive, to specific events, activities, actions or actors. People differ in their basic behavioural functions. Some are better ‘equipped’ to observe, whereas some have less tolerance for ambiguity, are more intelligent, more susceptible to opinions, more extravert, have less tolerance for unfairness (conscientiousness), or have better motor skills needed to act. These traits are stable, i.e. more or less fixed, and help explain why different people react differently to the same event or situation, or why the same person reacts differently to the same event over time. Although personality, coping style, ethnicity, gender, et cetera cannot really be changed, taking these into consideration is of great value. Understanding an actor – his norms and values, what makes him tick – enables the design of the most effective influence strategy. An actor’s body. Altering (parts of) the body, for example by killing, capturing, etc, has direct physical effects on the ability to act, as well as psychological effects. An actor’s means. Altering personal resources, means or tools, for example by removing, destroying etc, has an effect on the ability to act, and having personal items being touched or manipulated has psychological effects. An actor’s environment. The way the environment is set up can support or prohibit an actor from acting in a certain way. In addition, the way the environment is perceived affects an actor’s emotional state and cognitive processing. Alterations can be made to both the physical, social and digital elements of the environment. Between (alteration of) the engagement points, one can dicover mutual interactions. For instance, changes to an actor’s body (e.g. mutilation) can influence his role or position in a group (becoming an outcast, isolated, thus changing his social environment) in turn affecting his mind (frustration, depression, limited attention or information processing), altering his behaviour (a reduced influence on his community). Many more examples show that cognition interacts with emotion, individual characteristics interact with cognition and emotion, physical characteristics interact with psychological processes, and so on. This sounds complex, and it is; however, using the knowledge about these processes can change behaviour, also by means of military operations. Altering the engagement points can influence a person’s cognitive functions and pathways, and thus change behaviour. How this can be done is described in the following sections. For each category (body, means, environment) a selection of relevant contexts from the social sciences is provided, with ideas on what can actually be engaged and how to influence and change behaviour. This overview is obviously not exhaustive, and not to be used as a fixed template or mould – rather as thinking guidance. The direct way to change behaviour is to debilitate the actuators of the body that are needed to act, for instance, the use of tasers to paralyse the muscular system, or the use of flashbang grenades to blind, deafen, and disorient, and to capture, or confine people. But engaging the body also has psychological effects. The three main bodily elements that can be manipulated are: physiology, such as heart rate, perspiration, respiration, blood pressure; physical needs, such as food, clothing, shelter, procreation; and physical ‘state’, such as pain, hunger, sleepiness, body size, posture, muscle strength. An actor’s physical state influences his cognitive functioning by, for instance, impairing his memory, alertness, or reasoning. It can induce emotional states, such as anger, confusion, depression or happiness. Enduring noise not only desensitizes and disrupts information processing, it also agitates and frustrates. In addition, painful or harmful stimuli can elicit an automatic response, a reflex (see figure 1). They evoke the fright, flight or fight response. People avoid harmful situations, which is an evolutionarily developed survival mechanism that is quite persistent, and can be used in influencing techniques. When people get hungry or suffer from pain, the information is filtered and processed differently. Sleep deprivation, for instance, deteriorates cognitive performance considerably.,, As Simons et al. (2013) indicate, ‘it is generally considered that negative effects of sleep deprivation on alertness and cognitive performance become significant when total sleep time is less than 6 hours per 24 hours.’ It is also interesting to note that fatigue appears to cause an actor’s underestimation of his own capabilities,56 suggesting that fatigue changes the actor’s psychological state. Furthermore, high physical strain contributes to a decrease in cognitive performance. Body temperature can negatively influence physical performance.56 As mentioned by Anderson (2001): ‘Heat-induced discomfort makes people cranky. It increases hostile effects (e.g. feelings of anger), which in turn primes aggressive thoughts, attitudes, preparatory behaviours (e.g. fist-clenching) and behavioural scripts (such as ‘retaliation’ scripts).’ Manipulating or hacking digital climate control systems can thus be an effective way to influence performance and psychological state. Taking, destroying, disrupting or manipulating an actor’s means is not a goal in itself, but part of a comprehensive plan to change behaviour. It can directly limit abilities to act, but can also put an actor in a certain emotional state: anger, frustration, or feelings of distrust towards his materiel. The fact that these items are personal, with personal value (either practical or emotional), strengthens these psychological effects. For instance manipulating the control system of an actors’ vehicle or weapon system, can decrease his trust in that system and therefore influence his ‘will’ or ability to use that system. This goes for tangible objects and tools as well as for digital ones, such as bitcoins, software, or virtual real estate. As explained, people act on information from their environment, consciously and subconsciously. The environment can be manipulated to change the ability to act directly, for instance by roadblocks or enclosures. Furthermore, characteristics of the environment can be manipulated to induce a physical and/or emotional state in people, influencing their cognitive functions and pathways. For instance, people feel more anxious in enclosed (looking) spaces. In other words, the environment can be used and manipulated to affect feelings and behaviour. An example is the use of enclosure since being inside or outside matters, and consider narrow traffic roads to induce slow driving. Even visual illusions can be used. This use and manipulation of the physical environment can be applied in a military context, for instance, in deception warfare; in the design of checkpoints, compounds and access roads; or in putting up street lighting to increase feelings of security. In addition to the physical elements of the environment (e.g., infrastructure, buildings, vehicles) it is also possible to manipulate digital/informational elements, such as (design of) websites, social fora/platforms, games and social elements, such as groups that people belong to, social networks, and organisational ties. Governments increasingly try to change behaviour using a process called ‘nudging’. It is used to encourage, for instance, health behaviour, garbage separation, public transport usage. Nudging is about slight influences and capitalizes on the attractiveness of alternative options. Nudging efforts often address people’s need for simplicity or ease: choosing the option that costs the least effort results in the desired behaviour (e.g. putting healthy foods at close distance and eye level in stores). It is used in areas such as marketing, public policy, and traffic regulation. Focusing or diverting attention can facilitate if and how something is perceived, as well as manipulate appearances. Non-verbal communications (body posture, attitude) and how one behaves (PPP, events organised, friendships, dress) can induce certain emotional states which influence behaviour. Humans are affected by information: emotionally charged information attracts attention and is remembered better than neutral information. This is, for instance, used in news feeds and in social engineering techniques, and increasingly in military Public Affairs and/or Strategic Communications. The way information is presented affects cognitive processes by framing, hiding or changing information and information overload. Other examples include: disrupting or ‘frustrating’ digital information and communication systems, by changing interfaces, shuffling information, using disruptive sounds, changing the sound of voice (in phone calls). Computer and information systems can be hacked and disruptive messages can be sent. Cyber-attacks that manipulate data/information impede the utility of people’s external memory, debilitating appraisal and rule-based action. People’s social environment affects their behaviour considerably. A number of psychological needs originate from the fact that people live in groups: the need to be liked, to belong, to have a position in a group; the need for consistency and for having an identity and for social support (either emotional, instrumental, informational support, or social companionship). These social needs affect behaviour, sometimes contrary to knowledge, opinions, or motivations. They strengthen bonds between people, but also generate vulnerabilities. Ongoing social interactions generate emotional states, and sometimes even stress, in an effort to satisfy needs. The need to be liked makes people susceptible to peer pressure and persuasion, and being confronted with inconsistencies can induce stress. Both can lead to behaviour one is not intrinsically convinced about, or is even contradictory to one’s opinions or attitudes. People are inclined to match actions with words (and vice versa), and stick to promises made. This can be exploited by making agreements or addressing inconsistencies. The need to have an identity, and the need to belong are important reasons why ‘ingroups’ and ‘outgroups’ arise. The rationale for defining what is ingroup can be diverse, but the core is commonalities between people. Being part of an actor’s ingroup or outgroup matters: people prefer ingroup to outgroup; outgroup can be perceived as threatening. People are more easily influenced by ingroup members and will shift their beliefs in line with ingroup social norms. These social biases and ingroup-outgroup dynamics can be exploited, for instance, to surprise or deceive. Showing or addressing commonalities or shared identity with another actor can make a person ingroup, increasing the potential to influence that actor. Social support reduces the effects of stress, including those on cognitive functioning, such as the narrowing of attention, information processing, and mentalisation. This can be used to improve one’s own performance or to diminish intimidation or coercion of another actor via isolation. Social support also strengthens the need for fairness, on which the principle of reciprocity is based, which can be used in the context of enhancing an actor’s adherence and inclination to support by giving gifts, food, information or status. People are sensitive to status and power, influenced by that of others , and tend to desire to increase their own. Finally, people are likely to follow people with authority, which can be used by adjusting appearance and behaviour according to what is regarded as ‘authority’ in the area of operations. Peer pressure, authority, ‘herding behaviour’, the fear of being left out and scarcity are all principles that can be used to form crowds or change group behaviour. Crowds can be useful to hamper freedom of movement, divert attention or decieve a target actor. Being part of a crowd also influences cognitive processes: in the midst of a group, for instance, it is impossible to see or hear what is going on outside the crowd. This can be useful in deception or covert activities. In this age, many social bonds take place in digital space: digital social communities and networks, and also digital versions of people, the so-called cyber identities, come into being. Today, avatars and the use of social media and other media are paramount. This part of the environment can also be used: preventing access to Facebook or Twitter accounts, isolating people digitally, or ‘digital character assassination’ all have psychological effects and can induce emotional states. One can change and assume different digital appearances or identities (bigger, smaller, nicer, scarier), for instance, by manipulating the amount, type and content of digital identities or profiles. Military operations are activities to deliberately change other actors’ behaviour. With intentional influence, there is a source actor and a target actor. To effectively change the target’s behaviour, the source needs to make the dynamic patterns of behavioural interaction explicit. This enables the source to learn what lies beneath the visible behaviour of the target, which is necessary for influencing and changing the target’s behaviour. The source observes the target’s behaviour (act), analyses how this behaviour came about (appraisal), designs an influence strategy (decide) and proceeds to execute that strategy (act). This designed action in turn is observed by the target, who appraises and decides (how) to act upon the behaviour of the source. This target’s action is again observed, analysed and evaluated by the source (observe and appraise), to learn about it and, if necessary, adjust his influence strategy (decide and act). This continuous influence cycle is depicted in figure 5. 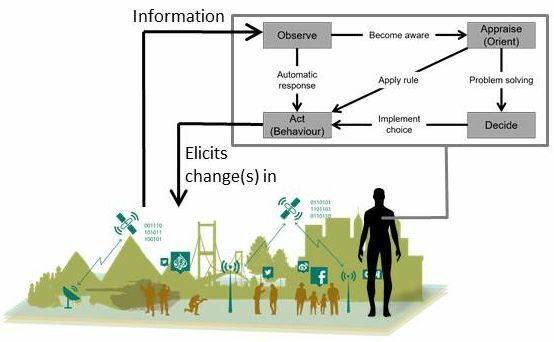 By continuously monitoring the target’s behaviour in relation to the status of the environment and the source’s own activities, the source can ‘learn by doing’, and become predictive about the actor and the system as a whole. It is important to realise that sources are also targets: actors continuously influence each other. This means that the notions and processes described in this article (and more) are also used by opponents against one’s own forces. The armed forces, its units and its commanders therefore also need to monitor and understand their own behaviour, how that influences the system, how others (could) influence them, and how this should be dealt with. To be effective in military operations, understanding is needed to hypothesise which behavioural functions (observe, appraise, decide, act), and which combination of engagement points (body, means, environment) are most suitable for building an influence strategy. Understanding can be achieved by probing, that is, engaging actors via multiple avenues of approach and exploiting the successful ones. Embrace complexity. Accept the unpredictable nature of the operational environment, the actors in it and the fact that having full knowledge and certainty is impossible. Know the objectives. What are (long term) mission goals, what is the desired balance in the system? Which actors are crucial for achieving this and what behaviour is desired from them? These things cannot always or easily be defined beforehand. But the commanders intent should at least describe the undesired behaviour of actors that has to be changed. Acquire knowledge of social sciences either by learning or by using expert advisors. Knowledge varying from generic principles to detailed relationships between influencing factors and behaviour can improve strategy. Know the actor(s) in order to provide the right stimulus. The amount of information and stimuli that people receive is enormous. People act on a combination of a set of those stimuli. In deliberate influence the source has to compete with other sources and other information. He needs to provide the most weighty, influential stimulus that is the hardest for the target to ignore. Success will be a combination of timing, dosage, and learning (trial & error). Plan small interventions. Learn about the system (the conflict, the environment, the actors) by assessing those interventions and be adaptive. Use this understanding to plan the next small intervention. The Netherlands doctrine on Land Operations briefly addresses this adaptive campaigning. Be creative. Change behaviour by engaging targets physically and psychologically. Use all of the engagement points, the whole scale of means and strategically combine them in order to change the target’s behaviour. Effectiveness of interventions starts with strategic thinking, which is only limited by the boundaries of creativity. All instruments of power, including all military means, can be employed to engage an actor’s body, means and environment, and influence his behaviour. All means can be used to strengthen or enable an actor, as well as to weaken or disable him. Each of the military means – ranging from manoeuvre, combat, fires, to engineering, stakeholder engagement, PsyOps, and cyber – can be used to support the whole spectrum. In the authors’ view, a categorisation of means does not exist: no distinction can be made between ‘physical means’ and ‘psychological means’ or ‘hard’ versus ‘soft’ power. Weapon systems can be used to create positive psychological states in people and psychological influence techniques can have equal or more destructive effects than combat or dropping bombs. In the human domain there is no distinction: all means of power contribute in their own way to behavioural change. This article aims to provide an understanding of how how social scientific insights can be used in military operations to change behaviour by influencing the underlying cognitive processes. It describes what the authors think needs to change in the military mindset and the process of design in order to effectively employ military means to affect cognitive processes and change human behaviour in traditional and non-traditional ways. Manoeuvre is also psychological influence, and psychological engagement is also playing hardball. Incorporating all methods in military actions is inevitable. It is already all around us, being the core of hybrid threats. Our actions in the physical, social and digital/information landscapes shape the behaviour of other actors, including the opponent. This article provides starting points for these actions, feeding into (future) capability development and doctrine. But what do you think? How do you think our armed forces should use this knowledge to protect our own capabilities, incorporate new methods in warfighting skills and capabilities, and integrate new and existing capacities into future manoeuvre? * Maj (res) drs. M. Duistermaat is programme leader Military Behavioural Influencing at TNO; dr. A.J. van Vliet is a senior scientist in the field of Behavioural Influencing at TNO; Lt. Col. A.F. van Daalen is Special Advisor to the NATO Senior Civilian Representative, HQ RS, Kabul and former staff member of CLAS LWC, bureau Trends & Concepts; Lt. Col. R.A.E. van der Boor is a staff member of CLAS LWC, bureau Trends & Concepts. The authors would like to thank brigadier general prof. dr. P.A.L. Ducheine (NLDA) for his contribution to this article. Pate, Amy. ‘Boko Haram: An Assessment of Strengths, Vulnerabilities, and Policy Options.’ Report to the Strategic Multilayer Assessment Office, Department of Defense, and the Office of University Programs, Department of Homeland Security (College Park MD: START, January 2014). Such as attention, information processing, problem solving, memory, reasoning, abstract thinking, pattern recognition, decision making and learning. Conflicts arise from differences or inequality between people. This can be with regards to nearly everything: territory, money, power, drugs, norms, ideology, religion, identity, self-worth, et cetera. The question of who determines what is unacceptable, if intervention is necessary, and by whom, is outside the scope of this article. NLD Ministry of Defence (2014) Doctrine Publication on Land Operations (DPLO). DP3.2 Par.4104: ‘Commandanten moeten activiteiten zo ontwerpen en plannen dat deze, in samenhang met activiteiten van andere organisaties, het gedrag van significante actoren beïnvloeden. Het beoogde gedrag van een actor vormt daarmee de basis voor het uitvoeren van activiteiten’. Par 2407: ‘Dwang (coercion of compellence) is de dreiging met inzet van militaire middelen met als doel een opponent onder druk te zetten zijn opstelling of gedrag te veranderen’. Large scale conflict intervention is almost always a multidisciplinary concern. Other terms that are used are Whole of Government approach or 3D approach. What is ‘normal’ is of course culture or community dependent (what is normal in one culture or society might be different for another society). People in sales or marketing are also behavioural change agents but the legitimate use of force is what makes the military ‘special’. Obtained through Target Audience Analysis (TAA). Obtained through several Intelligence techniques. Obtained through analyses such as root cause or drivers of conflict analysis. More on ‘Understanding’ can be read in UK JDP04, Understanding – DCDC, December 2010. This systems-view is also described in Ascalon in Section 4.2 about the conflict environment as an ecosystem and ‘flow-based operations’. NLD Ministry of Defence (2014), Doctrine Publication on Land Operations (DPLO). DP 3.2, par 6201: ‘Orkestreren van operaties is gericht op het plannen, voorbereiden en uitvoeren van tactical activities, inclusief verstrekken van de hiervoor benodigde opdrachten, beoogd om directe effecten te realiseren. Het orkestreren van operaties doorloopt een cyclisch proces waarbij opdrachten en resultaten continu worden gemonitord, beoordeeld en weer worden bijgestuurd. Dit gehele proces staat bekend als het operations process (ook wel genoemd action – decision cycle of battle procedure)’. Actors can be individuals but also groups of people. For simplicity, we speak of an actor in male singular. This is of course an effective way of changing behaviour, which can be necessary in some cases (e.g., self defence, with certain targets, or in certain situations). It is however also quite definitive, irreversible and indiscriminate. Like with Boko Haram, it’s the violent behaviour of the group that is undesired, not necessarily the existence of the group in itself. People are part of groups or, vice versa, groups consist of multiple individuals. A detailed discourse on group dynamics and (changing) group behaviour, however, is outside the scope of this article. Based on the work of Rasmussen on skill-based, rule-based, and knowledge-based behaviour. See for instance: Rasmussen, J. (1983) ‘Skills, rules, and knowledge; signals, signs, and symbols, and other distinctions in human performance models. Systems, Man and Cybernetics’, IEEE Transactions on, (3), 257-266. This pathway has a lot in common with second loop learning: Argyris, C. 2015, Double-Loop Learning (Wiley Encyclopedia of Management) 11:1–2. See for instance Kahneman, D. (2011), Thinking fast and slow (New York, Farrar, Straus and Giroux). Petty,R.E and Cacioppo, J.T. (1986), ‘The elaboration likelihood model of persuasion’ in: Advances in experimental social psychology, Vol. 19. Korteling, J.E., Brouwer, A.M., van den Bosch, K. (2016), Neurowetenschappelijke mechanismen van cognitieve bias (TNO 2015 R11707). Boyd, J. R. (1996), The essence of winning and losing (Unpublished briefing). Retrieved from http://dnipogo.org/john-r-boyd/. Boyd uses the term ‘Orient’. In psychology literature however the term orient is used to denote an immediate response in a change in the environment (the ‘orienting response’ or ‘reflex’). The way Boyd uses the term orient is more closely related to the psychological term ‘appraise’. Lazarus, R.S., & Folkman, S. (1984), Stress, appraisal and coping (New York, Springer Publishing). For instance risk avoidance (‘if something induces fear I will move away from it’), conscientiousness (‘if I don’t have all the information I will not act’), or agreeableness (‘I will only act if my group has consensus about the decision’). Limbs, voice, facial expression, for automatic/robotic systems this could be a print head or gripper. Reasoning about why an actor behaves the way he does and what his future behaviour will be based on knowledge of the actor and assumptions. Van de Pligt, J., Vliek, M. (2014), Overreden en verleiden – de psychologie van beïnvloeding (Pearson Benelux, ISBN 9789043028929; or Levine, T. R., Wheeless, L. R. (1990), ‘Cross-situational consistency and use/nonuse tendencies in compliance-gaining tactic selection’ in: The Southern Communication Journal, 56, 1-11. Cialdini, R.B. (2009), Influence: The Psychology of Persuasion (New York, Harper Collins). Dolan, P., Hallsworth, M., & Halpern, M. K. D. and Vlaev, I. (2010) MINDSPACE: Influencing behaviour through public policy (London, The Cabinet Office, Institute for Government). Festinger, L. (1962), A theory of cognitive dissonance (Vol. 2) (Redwood City, Stanford University Press). For a simple explanation of cognitive dissonance: McLeod, S. A. (2014), Cognitive Dissonance. Retrieved from www.simplypsychology.org/cognitive-dissonance.html. Gollwitzer, P.M., Sheeran, P. (2006), ‘Implementation Intentions and Goal Achievement: A Meta‐analysis of Effects and Processes’ in: Advances in Experimental Social Psychology, Volume 38, Pages 69-119. This is one of the reasons why changing the behaviour of people in conflict- or warzones is even more difficult than changing for instance consumer behaviour in our own society. Van den Berg, H., van Hemert, D.A., ‘t Hart, M.H.E., de Koning, L. (2014), Stop Reflect & Switch: Reflecteren in complexe omstandigheden (TNO 2014 R11564). Van Hemert, D.A., Van Beurden M.H.P.H., Van der Kleij, R. (2016), The role of Person Insight when influencing in (stressful) social interactions (TNO 2016 R11590). Similar traits can also be formulated for groups, organizations and even societies. Hofstede has done this with his six cultural dimensions: Power Distance, Individualism, Uncertainty avoidance, Masculinity, Long Term Orientation, and Indulgence. See Hofstede, G. (2001), Culture’s Consequences: Comparing Values, Behaviors, Institutions and Organizations Across Nations, 2nd Edition (Thousand Oaks, Sage Publications); also see https://geert-hofstede.com/national-culture.html. This stresses the importance of a solid Target Audience Analysis (TAA). For instance when a person is not used to making decisions on his own because he is part of an authoritarian group (dictatorship) or collectivist society, influencing his behaviour could be done by isolating him, taking away his social reference and by doing so disrupting his (normal) decision making process. A categorisation can be done in different ways and can always seem somewhat arbitrary as ‘hard boundaries’ cannot always be made. 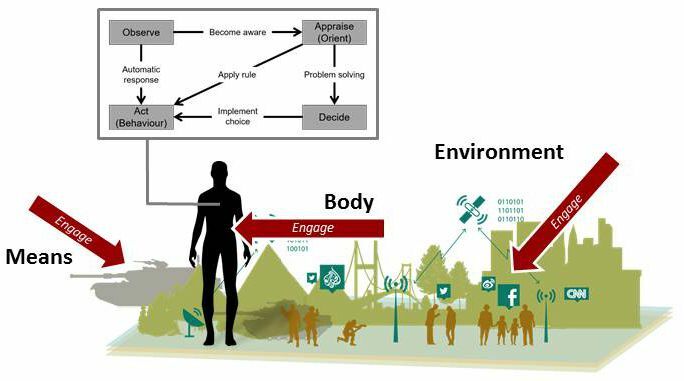 The framework we use (body, means, environment; see figure 3) seemed the most fitting to military practice. Seen, felt, heard, smelled, tasted. Understanding or ‘knowing’ (e.g. how something works) often reduces fear/anxiety and emotion influences logical reasoning (e.g., people choose a lower but short-term reward over a higher but longer-term reward). The type of personality one has influences which problem-solving approach is used (e.g. meticulous calculating options versus following instinct) or one’s previous experiences influence the emotional charge of and reaction to stimuli (e.g. frightened for (hearing the sound of) a helicopter or other loud noises, when having experienced an air attack). Physical postures can induce emotional states (e.g., frowning induces depressed feelings) and mental stress can cause physical symptoms such as headache or (muscle) fall-out. For individuals this is (cognitive) psychology/physiology, for teams social psychology, for populations sociology, history, economy, etc. For instance when hungry, information related to food becomes more salient than other types of information (it draws attention). Kahol K, Leyba MJ, Deka M, Deka V, Mayes S, et al, Effect of fatigue on psychomotor and cognitive skills, Am J Surg 2008; 195: 195 – 204. Daanen, H.A., van Ling S., Tan T.K. (2013), ‘Subjective ratings and performance in the heat and after sleep deprivation’ in: Aviation, Space, and Environmental Medicine, Vol. 84, No. 7, July 2013. Simons, M., Valk, P.J.L., Vrijkotte, S., Veenstra, B.J. 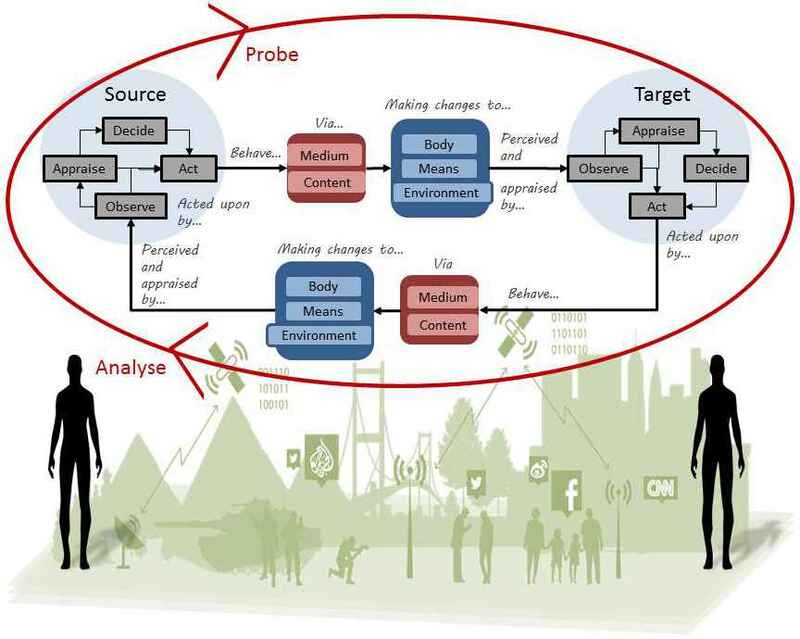 (2013), Performance and Health monitoring during a Marines Training Course (TNO 2013 R11469). Vrijkotte, S., Valk, P.J.L., Raymann, R.E.M., Simons, M., Veenstra, B.J. (2010), Measuring physical strain and cognitive performance in the field during an Air Mobile Brigade training course (TNO-DV 2010 A249). G.A. Anderson (2001) ‘Heat and violence’ in: Current Directions in Psychological Science, Volume 10, No.1, February 2001. It is why it was chosen to include this as a separate category in the framework (separate from the category of ‘Environment’). Experience showed that inside a bunker enemy fire was more frightening than outside, even though outside the risk is higher. Gal, R., Dayan, H., ‘The psychological effects of intense artillery bombardment: The Israeli experience in the Yom-Kippur war (1973)’, The Israeli institute for Military Studies, May 1992. Thaler, R. H., Sunstein, C.R. (2008), Nudge: Improving Decisions about Health, Wealth, and Happiness (New Haven, Yale University Press). A principle that is often used by magicians. The process of attention is described in much psychology literature, for example in Cognitive Psychology and its Implications (3rd ed.). A series of books in psychology (1990) by John R Anderson. Things can appear bigger, smaller, nicer, scarier, et cetera, by changing physical appearance. For instance: the specific shape, colours, noises/sounds of military vehicles, but also compounds/FOBs can be designed/built either ‘inviting’ (open, approachable appearance) or ‘deterrent’ (frightening, non-appealing). Bradley, Margaret M. (2000), ‘Emotion and Motivation’, in: Handbook of Psychophysiology, 3rd ed, ed. John T. Cacioppo, Louis G. Tassinary and Gary Berntson (Cambridge, Cambridge University Press) pp. 581–. Elisabeth Wehling (2016), Politisches Framing: Wie eine Nation sich ihr Denken einredet – und daraus Politik macht. Edition medienpraxis, 14; Cologne, Halem (http://www.elisabethwehling.com/books/). The evolutionary perspective explains this with the fact that being in a group was useful for humans and necessary for survival (e.g. forming a crowd and being in the middle of a crowd, enhances chances of survival when under attack by a predator). Of which the nature will depend on the quality and frequency of social interactions and ties can be strong or weak. An ingroup is a social group of which a person psychologically identifies himself as being a member. An outgroup is ‘the rest’ to which a person doesn’t relate. People belong to multiple ingroups depending on the shared characteristics (e.g. sport, religion, job position, parenthood). People can form self-preferencing ingroups within a matter of minutes and such groups can form even on the basis of seemingly trivial characteristics, such as preferences for certain paintings. See for instance Henri Tajfel, ‘Social identity and intergroup behaviour’ in: Social Science Information, April 1974 13: 65-93. See for instance Aronson, E., Wilson, T. D. & Akert, R. D. (2009) Social Psychology (7th ed.). Reciprocity is one of six influence mechanisms described in: Cialdini, R.B. (2009), Influence: The Psychology of Persuasion (New York, Harper Collins). Authority can be based on many different factors: appearance, money, expertise, role in society, job position, et cetera. Leong, Bond, & Fu (2006) state that culture may have an impact on the meaning of an influence strategy, on the context in which the strategy is successful, and on the susceptibility of its members for influence tactics. So, it seems that the specifics of the influence strategy (e.g. what is considered to be ‘authority’), determine its effectiveness in different cultures. Leong, J. L., Bond, M. H., & Fu, P. P. (2006) ‘Perceived effectiveness of influence strategies in the United States and three Chinese societies’, International Journal of Cross Cultural Management, 6(1), 101-120. See P. Ducheine & J. van Haaster (2014). Fighting power, targeting and cyber operations. In P. Brangetto, M. Maybaum & J. Stinissen (Eds. ), 2014 6th International Conference on Cyber Conflict: proceedings (pp. 303-328). Tallinn: NATO CCD COE publications. In addition to observing the behaviour of the target actor, all other available means should be employed to understand the behaviour of the target (e.g. analyse historic events, inquire the actor by for instance conversation, questionnaires, focus groups, analyse linguistic and cultural outings of norms and values, et cetera). The systematic unravelling of patterns by means of behavioural pathways, functions, the actors involved and the context in which this behaviour takes place, can be annotated in knowledge bases. Various organisations are developing these with various levels of sophistication. Examples are Google, Facebook, Twitter. TNO also researches the military applications of this way of knowledge storing and supporting decision making with system dynamics. A ‘Big Data’ approach is imperative for applying this effectively. doing something to the actor or his environment, monitoring and analysing how he acts on this, understanding this actors’ action and using that knowledge (learning) for your own next action. That specific stimulus (your own behaviour, actions, and manipulation of engagement points) which triggers the desired behavioural change in the target actor. This is in line with Boyd’s broader body of thought, which Osinga (2007) describes as ‘infused with the theme of multidimensional organizational adaptation in a dynamic non-linear environment’. See Osinga, F.P.B. (2007). Science, Strategy and War – the strategic theory of John Boyd (New York, Routledge) (quote from p. 256). NLD Ministry of Defence (2014), Doctrine Publication on Land Operations (DPLO). DP 3.2, Par 4415. Induce states such as joy, relief, reassurance or motivation and relationships of trust, friendship. Induce states such as fear, anxiety, confusion, distrust, intimidation. See Ducheine, P.A.L., Van Haaster, J., Van Harskamp, R. (2016), ‘Manoeuvring in the Information Environment’, in: P. Ducheine & F. Osinga, NL ARMS 2017 Winning without Killing: The Strategic and Operational Utiilty of Non-Kinetic Capabilities in Crisis (The Hague, Asser Press, 2017) pp. 155-179. Strategy is like a recipe in the sense that it’s about combining those ingredients that make the best tasting dish, instead of the discussion on whether a tomato is a fruit or a vegetable.